Animal Pattern Blocks is a toy that teaches! Match the shapes to create the animals on the board. 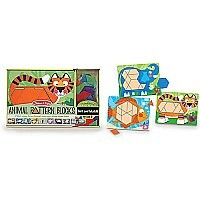 Great for eye-hand coordination, pre-reading skills, shape recognition, and just plain fun! Plastic pieces and five double-sided wooden animal boards. For ages 3-5 yrs.